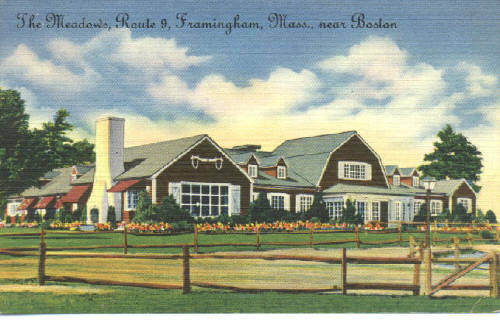 The Meadows, Route 9, Framingham, Mass., near Boston. 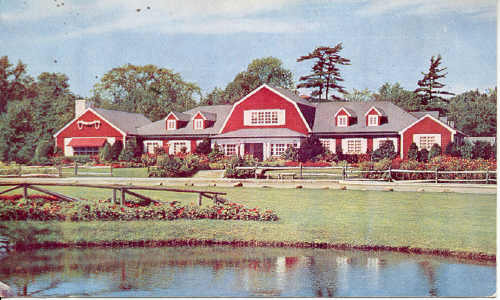 The popular nightclub was built by singer Vaughn Monroe. He broadcast his "Camel (cigarette) Caravan" radio program from here starting in 1946. In the 1970's it became "Beefsteak Charlie's." It burned to the ground in December of 1980. Today it is the site of "Bennigan's Restaurant" and "The Meadows Office Building." THE MEADOWS. Route 9, Framingham, Mass. A visit here is an enjoyable memory of superb food and delightful environment. Situated in a beautiful setting midway between Boston and Worcester. Open daily and Sunday for luncheon, cocktails, dinner and dancing.